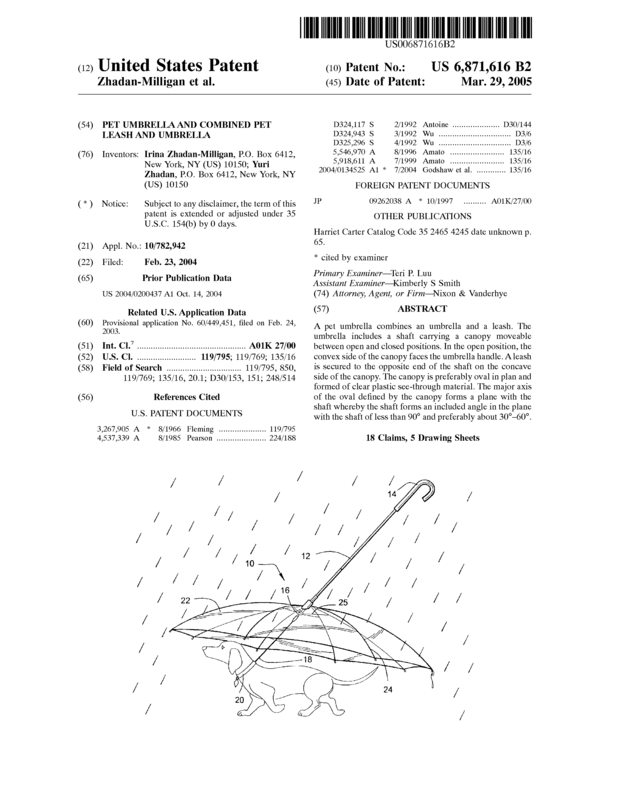 A pet umbrella combines an umbrella and a leash. The umbrella includes a shaft carrying a canopy moveable between open and closed positions. In the open position, the convex side of the canopy faces the umbrella handle. A leash is secured to the opposite end of the shaft on the concave side of the canopy. The canopy is preferably oval in plan and formed of clear plastic see-through material. The major axis of the oval defined by the canopy forms a plane with the shaft whereby the shaft forms an included angle in the plane with the shaft of less than 90 DEG and preferably about 30 DEG -60 DEG . We are looking for an outright sale, a license with royalties or a partnership with an investor. Our invention has not been previously sold or marketed. Excellent market potential: the pet industry in the United States is booming. Americans own more pets than ever before. Growth in the sector is derived both from increasing pet ownership as well as from increased spending per pet. Pet pampering is becoming the norm. Page created at 2019-04-25 14:03:49, Patent Auction Time.